Today is Uncle Gary's Birthday so Happy Birthday from your brother, your sister-in-law, and all your nephews! It's hard to describe all the great qualities about Gary. There are many stories that could be told about him. His brother could definately tell some secrets on him because they have a wonderful, close relationship...even if they talk in shorthand. I have heard phone conversations between the two of them that last all of about 3 minutes, but much gets said in that short time. Most of the boys' friends have had the opportunity to meet Gary at the OBB or at the high school talent shows. He is always the life of the party. He also plays a mean flip cup! One "Gary" story that makes me chuckle was the time Uncle Gary brought one of the infamous Lorobi's Pizzas to JMU for Tommy and his friends. He was bringing this pizza as a surprise from WVA because everyone knows Lorobi's has the BEST Pizza ever! Well, since it was a surprise, Tommy was not at his apartment when Gary arrived. Gary knocked on the apartment door, wearing an old man's mask and a Lorobi's pizza hat. Justin, Tommy's roomate at the time, didn't even blink an eye about the mask and proceeded to say something about them not ordering pizza. I don't know what I find funnier, the fact that Gary would pull a trick with the mask and Lorobi's hat OR the fact that Justin blithley opened the door to a masked pizza delivery person and carried on a normal conversation. His nephews definately like jamming with him while he plays the drums and tailgating with him at WVU. We all love doing some " front porch sittin" at his house and all the great get togethers in WVA. We all love Uncle Gary because he enjoys life, loves his family, and is just an all around great guy! So Happy Birthday! Yeah Uncle Gary! I'm one of the people who's met him at the OBB. 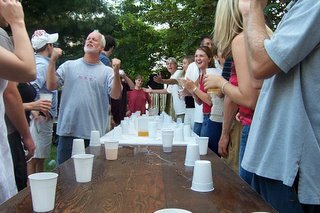 Gary makes me strive to be a better flip cup player. Happy Birthday Gary. Famous quote from Gary to me when I might have been 16. "Keep it in your pants." happy birthday gary and I know how old you are~!! uncle gary is the man ... 'nough said!